Photos and Links to what we were talking about. Who are we and why are we podcasting? Hi, I am Kelly (1hundredprojects on Ravelry), and you'll meet my friend Marsha (mfuesel on Ravelry) on the podcast. Click on the user names to see our project pages. We came at yarn and fiber from different directions, but we both love it. It is one of the many interests we share after over 30 years of friendship. Another part of our friendship has been adventures! Many, many things that I would never have done alone have come to fruition because of Marsha's willingness to participate with me. She says I am the more adventuresome, but I'm not really sure that's true! After a couple years of a knitting podcast obsession, I wondered if I had something to add to the conversation. Was there a place for another knitting podcast? I talked to Marsha, and Two Ewes Fiber Adventures was born! I'm a Spinner who knits rather than a Knitter who spins. 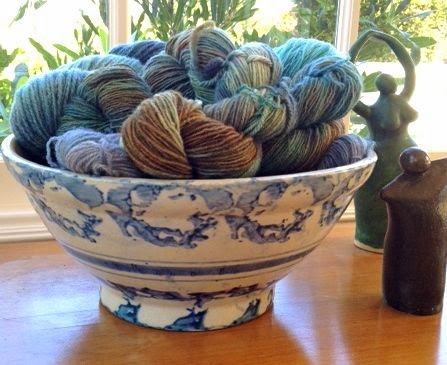 Spinning and dyeing since 1998, I want to share what I know, learn more, and participate in a larger community of fiber artists. Wool from "meat sheep" spun woolen, in various weights, and hand-dyed. My most recently completed knitting projects. The Acorn Trail Custom Fit sweater is finished. I am already working on another Custom Fit. I have also completed a frenzy of baby knitting for a work colleague and for a soon-to-be-born grand niece or nephew. Newborn Vertebrae by Kelly Brooker, Mignon by Loop London, and various baby socks using leftover sock yarn. 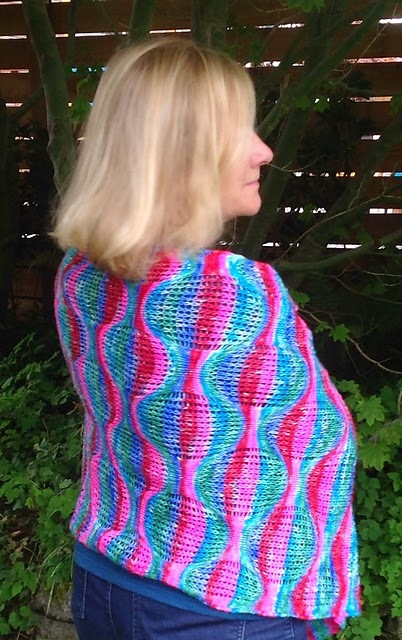 Camino Bubbles Shawl by Kieran Foley. She loves the pattern and the excitement of dropping stitches on purpose! Her first time dyeing for long-color-repeat, self-striping yarn. Marsha used her dining room chairs as a DIY warping board to wind the yarn so that she had 8 yard repeats of each color. She used this website for a guide. This side of the shawl has the dramatic color contrast between warm and cool colors. The Camino Bubblegum Shawl project page on Ravelry. The brightness of the colors was a surprise and caused much discussion among her Seattle friends and family. They are decidedly not the typical northwest color palette! She liked them more and more as she knit with the yarn and the shawl emerged. She even discovered that more famous designers (Colinette, for example) are currently using the same high-energy colorways! Freedom from expectations can be exciting--be open to what you end up with and just play with color. If you don't like it you can always give it away to someone who likes it better than you do! The end of the podcast features live (and somewhat silly!) audio from our trip to the San Luis Obispo SLO Yarn Crawl. We experiment with podcasting at the restaurant Luna Red in SLO. Beautifully prepared and delicious tapas served on an outdoor patio across from Mission San Luis Obispo. We will talk more about the SLO Yarn Crawl in episode 2.